Museum of Contemporary Art Embraces Art Educators! The Daily Mural Project, presented by Emily Goff, Art Teacher, Daily High School (Glendale Unified) and Roger Dolin, Director and Muralist, Mural Environments, Inc. The galleries were open before the event, and an interesting exhibit featuring works from the permanent collection also provided inspiration. Thanks, MOCA, for your unwavering dedication to supporting teachers and students in Los Angeles! PEER MENTORS: Fall semester is five weeks in and report cards will go out next week. This is when all students are invited to join our AOAT Peer Mentors group which just launched with a Mentor/Mentee mixer on Wednesday. Seniors and Juniors serve as tutors and “big brothers/sisters” to Freshmen and Sophomores who want some help with adjusting to high school. The turnout brought a capacity crowd of enthusiastic AOAT students together to put into practice our motto: we are family, and care about each other’s success! ART CLUB & HOMECOMING: This AOAT-sponsored group meets during lunch on Thursdays, and soon will begin the biggest project of the year, designing and creating the Homecoming float! We have a tradition of amazing floats, from the painted backdrops and props to the fantastic costumes and make-up. Winning first place is the goal, but the real payoff is the fun of teamwork and the creativity of the students. ADVISORY BOARD: This week is the first meeting of our Advisory Board, a group of dedicated partners who help with many Academy activities and support all our efforts to provide the best possible experience for our students. Everyone is invited to attend: September 16, 6:30 pm, room A-2, Cleveland High School. This meeting will start with a potluck, so please email Co-Coordinator Donna Mercer if you plan to attend: dkm2363@lausd.net. 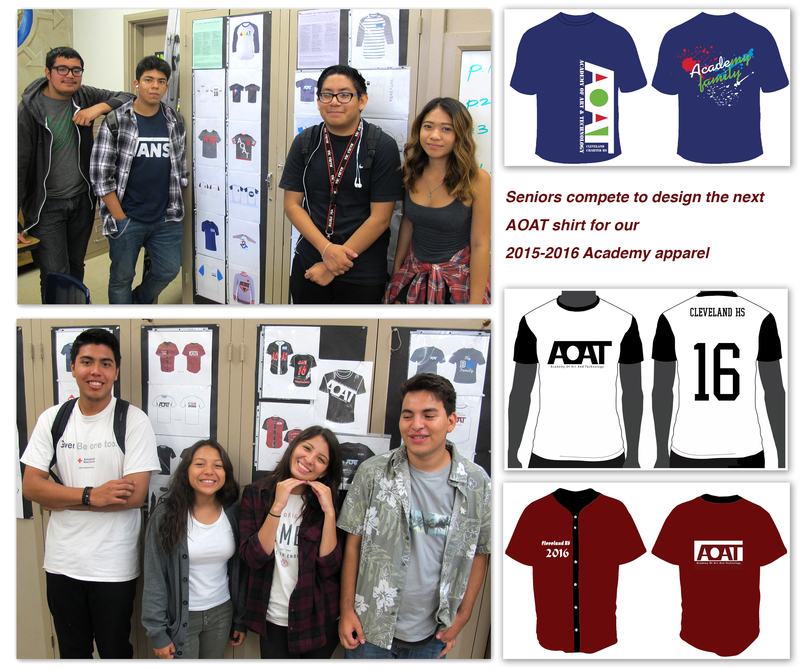 Each year we kick off fall semester with a creative challenge: Seniors must design an Academy shirt they would be proud to wear – and be willing to purchase! This year the styles of shirts were as varied as the graphics they display. Some students want baseball jerseys, some basic Ts, some prefer long vs. short sleeve crews. Now the hard part – narrowing down the options for a general student vote. Any shirt printers out there want to support AOAT with super discounted prices?? The most unusual graphics were also the seniors’ top pick. “Bill’s Got My Back” is a tribute to our teacher Bill Diebold who truly supports whatever the kids need with generosity and love.